No matter how stringent is the rules and policies of the organization, fraud and theft is something unavoidable. Be it a small organization, limited firm, partnership, or even non-profit, all of them have faced fraud at some point of time. It is a serious issue, as it has several impacts including financial losses and harm to reputation. Most frauds are ongoing. Once the fraudster starts, its hard for him or her to stop. He will start by stealing say $100 at first and later raising the amount. Fraudster gains his confidence and willingness to steal larger amount as his fraud goes unnoticed. Internal controls are often proven to be ineffective as business changes at a fast pace, new products, services, news positions, new employees; change is the only constant thing in the organizations. Having a year old internal control will hence be total waste. Fraud at workplace happen when the managers and seniors are busy in their daily activities and could not pay much attention to the employee/s. Personal problems like gambling, debt and drugs often trigger employee to commit fraud. Most fraud involves theft of cash rather than any other tangible asset. Pressure of hard targets to meet, pressure of working hard to get promoted or some personal factors like gambling and debt leads employee to commit fraud. Committed fraud may not resolve the building pressure but the fraudster perceives it which may help him relax or feel good about himself. The fraudsters who fall in the category of rationalization do not consider themselves as a criminal but perceives themselves as the victim of circumstances. They convince themselves in such a way that they are not guilty to commit the crime. Rationalization occurs based on external factors like- family difficulty or pressure of financial support to family. A golden opportunity of committing a fraud and knowing he will go unnoticed provokes the employee to do it. Bad culture and environment of organization like lack of internal hierarchy and control, blame culture will motivate the fraudster further to take the step. Organizations often store the key data of their clients or the financial information on computers. Hacking into the servers and altering the websites is a piece of cake for an expert hacker. The sensitive data can easily be accessed if the internal security is weak. Impersonating a person or whole organization by identity theft statistics is one of the type of workplace fraud. The fraudster will deceive the customer, alter the company decisions, order goods and do stuff for his own benefit. Organization must have a strict control on the passwords and the important data related to identity. Presenting a financial report by altering their true picture for the sake of own financial gain, will come under manipulation of accounts. The fraud employee makes changes in the purchase of stocks or sales. Every organization faces petty frauds. Employees do not consider themselves guilty as they think doing this type of fraud possess any loss to the organization. It includes things like stealing office stationary, taking personal printouts, altering the bills which are reimbursed by company. A small fraud by all the employees will together prove to be a big loss to the organization. Fraud is necessary to be addressed on time. It is necessary to take steps for preventing fraud, as it has the following impacts on the organization. The loss of funds or the goods may affect the share price if the loss is large in number. High loss of funds suggests that strict rules and keen eye on employees is must to have. Fraud at workplace spoil the reputation of the organization. Clients and prospects lose faith and may not have a long term association. It’s obvious that people want to associate with the company which has ethical employees and the work is smooth. Fraud which caused high loss definitely affects the employee morale. Internal trust of employees is damaged. Employer will keep tabs on all employees including the honest ones, which may make them feel bad. Attrition rate also rises as employees do not feel secure in the environment. Retaining the employee and gaining their trust again is a difficult task for HR and the management posts the fraud. There are 10 rules one can follow to prevent fraud at workplace or theft. If organization has one or more than one partner, it is wise to have a written contract by consulting a corporate lawyer. Identification of all the partners, description of business, Responsibilities of each partner towards the company, detailed explanation on compensation, reimbursable expenses, information related to insurance, confidentiality clause, copyright and intellectual property, clause of modification, Termination of employment, financing and lastly signatures. Having a written document helps to have clear terms with all the partners and thereby reducing the fraud and conflicts. Selecting wise employees with moral values will help reduce or eliminate the fraud at workplace. But recognizing these kinds of employees take time and effort. Make sure to take necessary steps for reforming the hiring methods so as to select good employees. Few tips are as follows. Pay attention to people who will be directly handling the cash, accounts and stocks. Have realistic expectations from the employees, and be clear on job description, line of control, working hours and policies. Offer salary as per industry standards. Clearly specify in the company rule book the implication if found committing a fraud. Insure that employees understand them well. If needed arrange a training session which will help them get the clarity. One can also establish a good communication channel for employees where they can file the report. Assure them the information will be handled confidentially. It is wise to set up anonymous phone service where employees are assured that their identity will not be revealed. Keep an open eye and check randomly on accounts, purchases, sales department. Have preparation of payroll done by two people from different teams. Also avoid entrusting the entire accounting to single person. Assign the task of counting the inventory to someone else other than the person who handles the inventory maintenance. Make sure employees leave on time after their shift is over. Keep eye on employee with unusual behavior. Cheques– Be the signing authority of all cheques. Reimbursements – Allow employees to stay in pre-approved hotels and restaurants only, wherein they will not get a chance of producing fake bills. Cash drawers– Do not keep too much petty cash lying around at workplace; have surveillance monitoring employees’ actions. There are high probability that the merchandise and goods will get stolen if not kept an eye on. Few tips which help reduce the risk is as follows. Keep the delivery items sealed, add a note “do not accept if packing is tarnished”. Resolve the complaints related to invoice, discounts and vendor payments, keen observation may help you to catch the culprit red handed. Ensure to have the important goods locked and guarded. Install video surveillance system in key areas like accounts, lockers, inventory, employee records, and server rooms. Make sure the quality of the video and images produced by the camera is of good quality. Have a good lighting – cameras require good light to capture quality images. Also a well-lit area demotivates employees to sneak at places that they are not supposed to visit. Combinations, Keys and access codes: Never give keys and combination codes to anyone other than trusted employees, change the combinations when employees leave. Duplicate keys: Never make too many duplicate keys, keep note of the keys whenever circulated. Get controlled locks: The keys to the controlled locks are hard to duplicate, it costs more but are worth the investment. Be attentive of hackers accessing your personal information. Payroll list, company revenue, bank statements, pricing list should all be kept protected. Keep copies of the key data stored somewhere safe. Use digital signature in emails. Making personal calls, making long distance calls from company’s phone can also be termed as fraud. Have clear policies defined for the use of phone calls. Also do not permit everyone to make calls. What to Do after Termination of Employee? You can sue the employee for fraud, you need to have enough roofs to do that, and you can seek to recover your losses. The authorities may seal the bank account and passport of the fraudster, till the issue is resolved. Local law will investigate the case and ask the employee to back the losses if found to be guilty. Employee can get prosecuted if he fails to replay back to employer. Theft insurance protects employer from all current and former employees, partners, members and management. Though it will not include- accounting errors, government raids. Thus we saw the causes, impacts, prevention and steps post fraud. One should not panic when you suspect fraud at workplace. Have strict internal controls and reevaluate them from time to time. Keep a keen eye on employees, having surprise checks will help you do that. The rules and policies against the fraud and theft should be written with diligence. 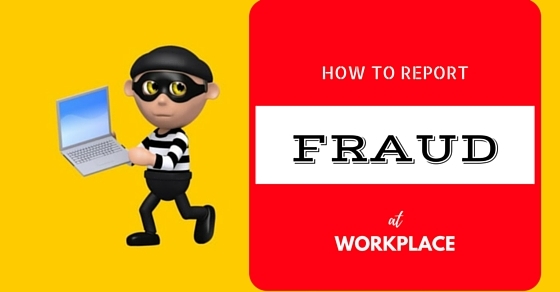 Make sure your employees know the policies and the repercussions of committing the fraud at workplace. If you suspect a fraud act carefully and collect enough evidence, termination will call for solid proofs to be presented. File for case or repayment only if you think it’s worth the time and money. Not everyone is a thief, yet fraud at workplace is very common. It is rightly said “prevention is better than cure”, and this principle fits well for workplace fraud and theft.